Like many before him, this guy got his Hebrew ink backwards. Unlike others, this backward tattoo has a meaning. It reads as a slightly misspelled "The Mocker", nifty eh? For those considering a similar tattoo, I should mention that today's victim had chosen an unusual word for "Salvation". In Hebrew, the word "Geula", when written correctly, does mean "Salvation", but it's not the only word with that meaning. 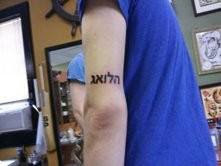 Usually, Christians like "Yeshua" for their Hebrew tattoos, as this is the word which the name Jesus derives from. The top word is "Geula", Salvation as our victim originally intended. On the bottom is another Salvation, the one Jesus was named after. Pick your favorite! I thinkg that geula is more "redeption" rather than salvation (which is Yeusha), because geula means to redeem someone (lig'ol) while "lehoshia" to si save or help someone (salvation). Anyways its almost the same thing - tometo, tomato. Great blog though! :-) I love it and I'm gonna post a link at my blog. There should be an Ayin instead of the Aleph. love your work doberman. If you are a tattooist I can see how a lot of these tatts get messed up. Oh and by the way in the expression Tomato, Tomato they are both spelled the same they are just pronounced differently. Hence the expression.